Part 2 of Mason Ginsberg’s and Ryan Schwan’s point-counterpoint argument on whether Carl Landry should be retained this coming off-season. 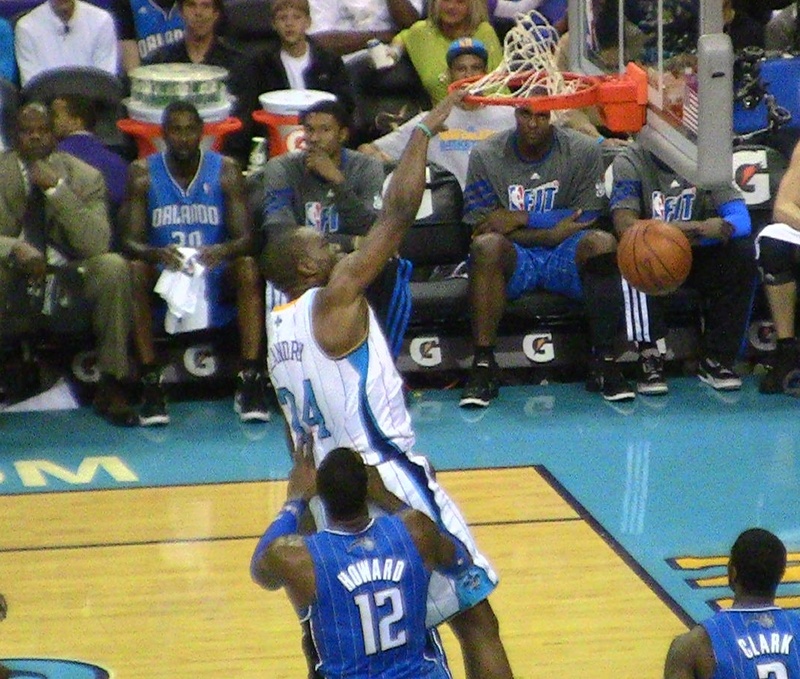 Where will Carl Landry be making plays like this for next season and beyond? The Hornets have a few players from this past season headed for free agency. Among them is power forward Carl Landry, a player who was often the first Hornets player off the bench, typically receiving starter-type minutes. He brings highly coveted interior scoring, largely due to his impressive ability to draw fouls and get to the free throw line. While defensive rebounding has never been a strength for Carl, he finally seemed to be making positive strides in that area this season. On top of his contributions on the court, he appears to be a habitually upbeat guy and a great teammate. For all of the above reasons, I am a big fan of Carl Landry; however, I don’t think he should remain a Hornet for next season and beyond. This belief has little to do with what he brings to the table from a talent perspective. For me, it’s all about how he fits within the framework of the team in both the short-term and long-term. The following four points are the issues that prevent Landry and the Hornets from being an ideal fit. 1) Congestion at the power forward position. Between Jason Smith and Gustavo Ayon, the Hornets have a good bit of somewhat newly-found talent at power forward. Smith and Ayon were two of the team’s most efficient players last season, as both ranked in the team’s top 5 in PER. Assuming Ayon puts in the necessary conditioning work this offseason to adjust to the more intense NBA schedule, the two appear to be capable of sufficiently handling 48 minutes of action collectively. 2) The NBA Draft. This is largely related to the first point, but the upcoming NBA draft is loaded with talent at the power forward position; in fact, as of today, 5 of the top 10 players on Chad Ford’s Top 100 list on ESPN.com are listed as power forwards. As a result, it would make sense if the Hornets were to use one of their two lottery picks on one of those players. Should that scenario occur, bringing back Landry would make even less sense, as it would then give the Hornets four guys deserving of legitimate playing time who play the same position. 3) Salary Cap ramifications. Not even discussed yet is the money that it would take to keep Landry in New Orleans. It would be reasonable to assume that he’ll command a contract valued around $7 million per season with a length of 3 or 4 years on the open market. For comparison’s sake, Jason Smith and Gustavo Ayon will make a combined total of $4 million per year over each of the next two seasons, and Ayon has a qualifying offer of just under $2 million for the season after that. Bringing back Landry for that kind of money (even if he would agree to a shorter deal in order to stay here) would completely negate the advantage gained by locking down Smith and Ayon to such favorable contracts. While a power forward rotation featuring mainly those two players may not be considered a position of strength, it would free up the team to devote more cap space towards shoring up other positions of need. 4) Age. By the start of next season, Carl Landry will be 29 years old. While that’s not “old” in a professional basketball sense, it’s not young either, and the Hornets are clearly in the middle of a youth movement in order to build for the future. With Smith having just turned 26 and Ayon just making 27, Landry would be the oldest of the bunch, and a new deal would take him into his early 30s. It would probably be in the Hornets’ best interest if they opted to bring in younger players with more room to grow. I wish Carl Landry the best and have the utmost respect for his offensive game, but I think that it would be in both he and the Hornets’ best interests if he moved on to another NBA franchise to continue his basketball career. I see the draft and the EJ plan as the main factors here. There will be many roster moves. If the front court remains intact otherwise, give him a Hubig’s on the way out. The only argument I can see being made for bringing back Landry regardless of other moves is the: collecting assets argument. If Landry is willing to do something like 3 years/ 15 million, he will be an attractive asset that we can offer in trades once guys become available- or having him makes it easier to move Smith or Ayon if X team prefers one of those guys. We can go over the cap to sign Landry, we couldn’t go over the cap to sign Illysova or Ryan Anderson, so it may just be a numbers game at that point- one in which we maintain an asset for future use. So why would Landry agree to be an asset the Hornets collect, especially when he can sign elsewhere (probably for more money)? I don’t see the logic behind Landry making that move. I like Landrg wish him the best where ever he ends up(especially if it’s with us). I just can’t see us being a top tier team with the core we have. Like mentioned we need a youth movement. IMO it’s better to approach it like a band-aid. The sooner the better. After reading both posts on the issue, I’d like to raise a point. At the end of the season, with Kaman and Okafor both injured, J. Smith saw time at center. While I definitely don’t believe he should play center, he could be utilized as the reserve center if the Hornets do not bring back Kaman or move Okafor. This would especially be the case if the Hornets draft Thomas Robinson as everyone is currently projecting. Obviously this is far fetched. Monty’s actions throughout the season give me the impression he does not want to play Smith at the 5. Personally, I much rather Smith at the 4, especially with his ability to hit 17ft jumpers. To finally get to the point, the only way I see the Hornets bringing back Landry is if they draft Robinson and don’t sign a backup center in free agency. Otherwise, J. Smith, Ayon, and Robinson will be begging for minutes at the 4, thus there will be no room left for Landry. I think you guys are going into free agency talk way too early. The focus right now is the draft. What we do in the draft will heavily influence what we do in free agency. Right now, we could draft a number of positions. A PF may be a possibility but that doesn’t mean that we’re going to 100% take one. I’d rather you guys do points/counter-points about draft prospects/draft night trades, how they fit in to the team, and how they affect other players who are already on the roster. Honestly, we won’t have a clue what direction the team is headed in free agency until we know who we draft or acquire during the draft. They’ve actually been covering that a lot in the podcasts. Besides, nothing has changed about our team or draft prospects really since the NCAA tournament ended over 2 months ago, so there’s no point in talking about that over and over. Their podcast aren’t very specific or detailed. It’s more of a generalized opinion of these guys. What I want to see is a detailed look on how each prospect fit and what they can do for THIS team. Kind of like Draftexpress version of “Find a niche for…” articles about prospects but specifically tailored to the Hornets. I’m tired of reading generalized opinions of players. For example… Everyone hates Barnes because they don’t see him as a #1 option and harp on what he can’t do. If we can get the 247 guys to focus on how he can help the team and the things they bring to the table SPECIFICALLY to the HORNETS, then it gives us a better idea of why drafting certain players are good and why others are bad. I guess what I’m requesting is a much more indepth look at the prospects through their skillset and the reasons why their skillset can be advantageous to the team. I’m not getting that kind of info in their blogs,podcast, or wherever else they may be posting. Writing about players is totally not my thing, but I recognize passion and can appreciate it totally. I know if I were going to assist in making your request a reality, I’d want an example or template (or a couple) to work from in terms of style. You want a collection of rebound rates etc.? Those are available elsewhere, so you must want something else instead of that or in addition to that, for example. Also, I think 504ever is right. If I were doing this thing, I’d spend my scant time (see Mr. Gonna Hate) doing detailed analysis in a more focused way, then a super-duper post once we have folks in hand. I know that’s how I handle some things in my bailiwick. I think useful draft analysis will come after our drafting position has been determined next week. What if our pick ends up being #2 and Minni’s is #10? The Minni pick ends up being top 3 and ours is top 6? These are just two, ‘that would be great’ scenarios, that require extensive analysis, including trading at least one pick. With two top 10 picks of unknown placement, there are almost endless possibilities to analyze. In eight days, the possibilities will be down to one. Then the analysis will start. You can literally pick out 15 guys in the draft and do a segment on each one. I’m not sure why we need to wait. Throughout the year I have covered the prospects in this draft, and I have actually talked many times about who fits and who doesn’t, what they would add to the team, etc. It is a giant puzzle with pieces that are moving constantly and an infinite amount of outcomes. You have to be more proactive in your thinking, and I think that is what the guys are trying to do in this point-counterpoint piece. Same with the Dragic one. Trust me, we will cover the draft inside and out, and I guarantee we do a better job than any blog (or newspaper for that matter) than you have ever seen- but I do not agree with it being the sole focus at this time. If we select Anthony Davis, will not need Carl Landry. I prefer to maintain Jason “Blake’s Hunter” Smith and Gustavo Ayon in our roster. Monty said he wants to add size to the frontcourt. Carl does not offer that. He will not be brought back. As stated earlier, when you already have 2 guys that are making less money and playing at a higher level with room to grow you stick with them. Now, who in the draft fits the Hornets style of play? I want to know only about frontcourt players with size. Everyone knows the nickname the Jazz belongs in New Orleans BUT did you know Utah is the Beehive State?! Hornets live in beehives. Sign the petition, baby!! I thought Hornets lived in nests? None of this matters right now. We will see what happens at the draft lottery. If we finish with picks 1, 3 or 4, chances are we will end up with a big guy. If we finish at 2, we will probably get MKG. If that happens, then the chances of re-signing landry going up. If we finish with 6 and end up with Barnes, then we could possibly re-sign Landry. If Boston offers Rondo for our 2nd pick and Ayon, then we don’t have depth at PF. If we unload Okafor and don’t re-sign Kaman, then Smith probably moves to the backup 5. There are so many variables with this team now, that it is impossible to predict who will be back and who won’t. 1. KAMAN WON’T RESIGN SO OFFER HIBBERT MAX MONEY. 2. DRAFT HARRISON BARNES AT 4 AND PERRY JONES III AT 10. 3. EXTEND OFFER TO DJ AUGUSTIN OR TRADE ERIC GORDON FOR MONTA ELLIS WHO PROBABLY ISN’T GOING TO FIT IN MILWAUKEE.